This post brought to you by Sargento® Cheese. The content and opinions expressed below are that of Garnish & Glaze. Calling all meat & cheese lovers! 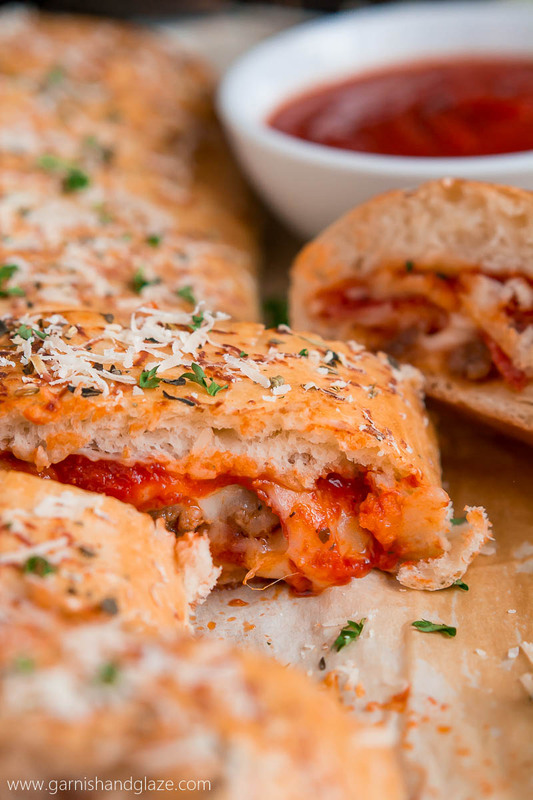 This Sausage & Pepperoni Stromboli is for you! 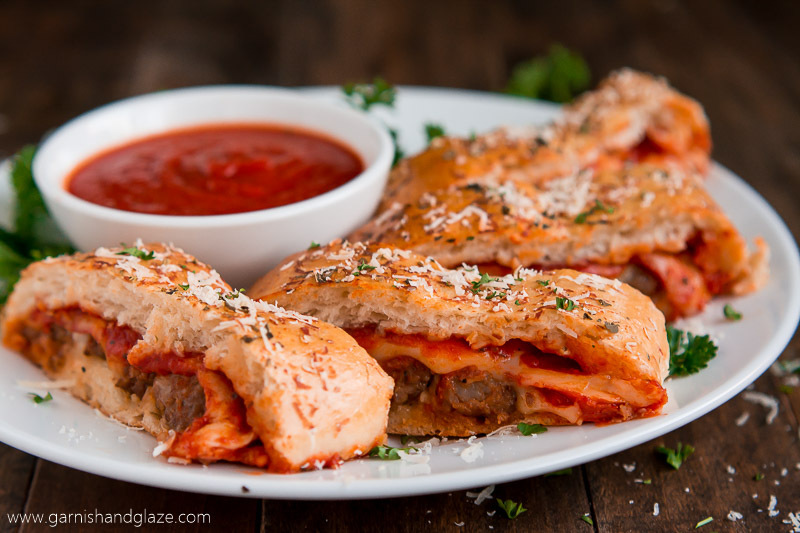 Warm meat and melted cheese all wrapped up in seasoned pizza dough. If I had to choose one food to eat for the rest of my life (not including desserts) it would be pizza. I just love the combination of bread, cheese, sauce, and endless topping possibilities. With all the various topping combinations (and my super easy No Knead, No Rise Dough) I really could eat pizza everyday the rest of my life and have a different pizza each time. I’m sure I’d have my favorites, one being this Sausage & Pepperoni Stromboli! How cool is this! It’s basically a pizza rolled up. In other words, a gigantic calzone. Awww yeah! My family pretty much inhaled this. There were no leftovers of this meal. Which is kind of a bummer because I wanted more! 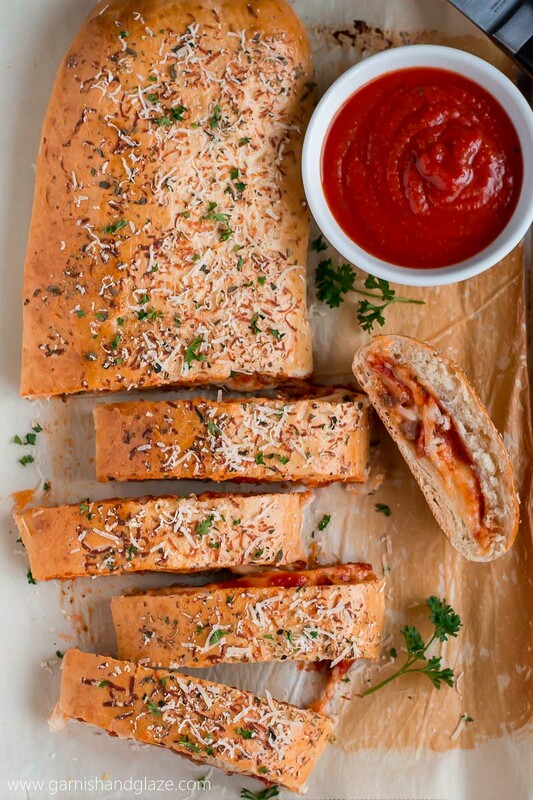 One of the best parts about pizza is the cheese and the same goes for this stromboli! I used Sargento® Sliced Cheese, Flavorful, 100% real natural cheese. I love that it’s already sliced and ready for me to use in this stromboli, sandwiches, or when my kids are whining for some food. Because believe me, the time it takes to cut a slice of cheese is eternity in the eyes of a child… and the mother listening to the crying child. ha! And the kids love it! Especially more than the Pasteurized Process American singles cheese which really only contains 51% real cheese. The bread for this stromboli is made using my No Knead, No Rise Pizza Dough recipe (I just made half the recipe) which is amazing! But if you really want to cut down on prep time you can buy refrigerator pizza dough. Press or roll the dough out on parchment paper on a cookie sheet and start layering your toppings down the middle. 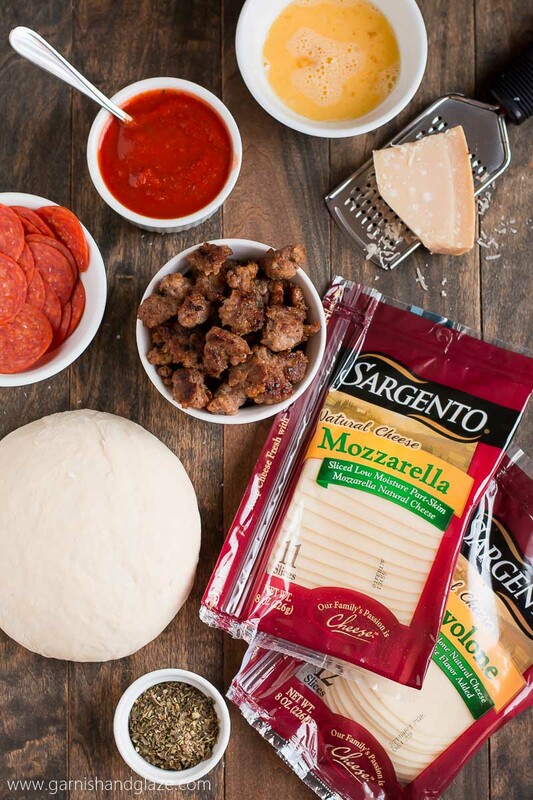 Begin with your favorite pizza sauce followed by Sargento’s sliced Provolone Natural Cheese, pepperoni, Sargento’s sliced Mozzarella Natural Cheese, ending with sweet Italian sausage. Fold one long side over the sausage and then the other. Pinch that last side so the dough is sealed and then pinch the short ends. 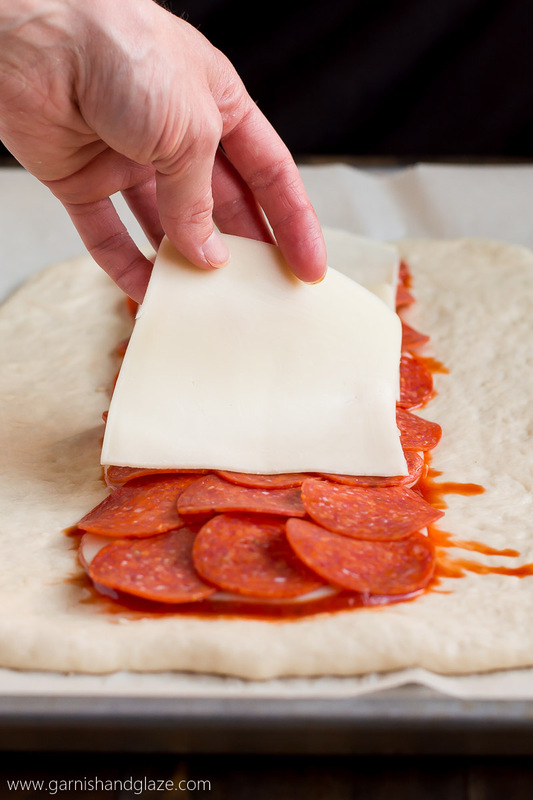 Flip your roll (I just lifted the parchment so it rolled over), brush with egg wash, sprinkle with Italian seasoning and Parmesan cheese, and pop that Sausage and Pepperoni Stromboli in the oven for 20 minutes until golden. Let it sit for 10 minutes so you don’t get a steam burn when cutting into it. Slice it up into 1 inch strips and serve with extra pizza sauce for dipping. 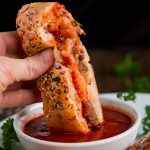 You can fill your stromboli with all sorts of toppings and various flavors of cheese. 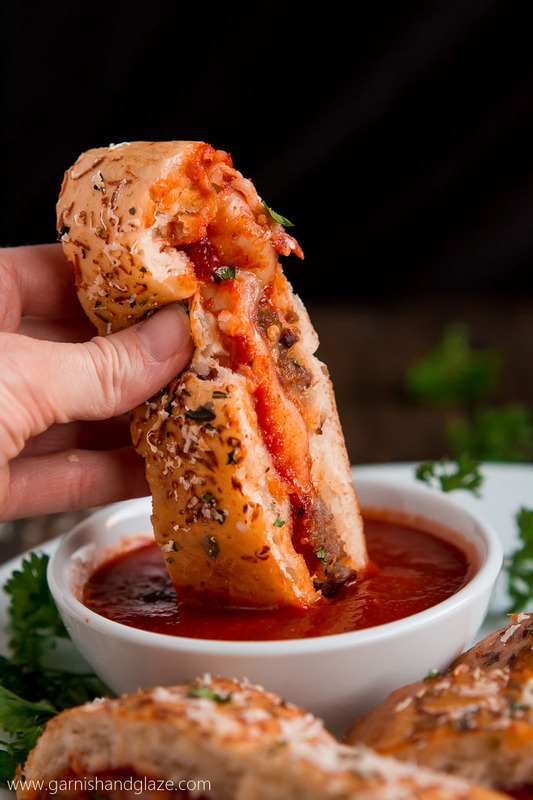 What will you fill your stromboli with? Follow Sargento on Instagram and Facebook for more recipes! Cook sausage over medium-high heat until cooked through. Remove and place on a paper towel lined plate to drain. Meanwhile, make the pizza dough. Roll dough into a rectangle on parchment paper and then place on a baking sheet. 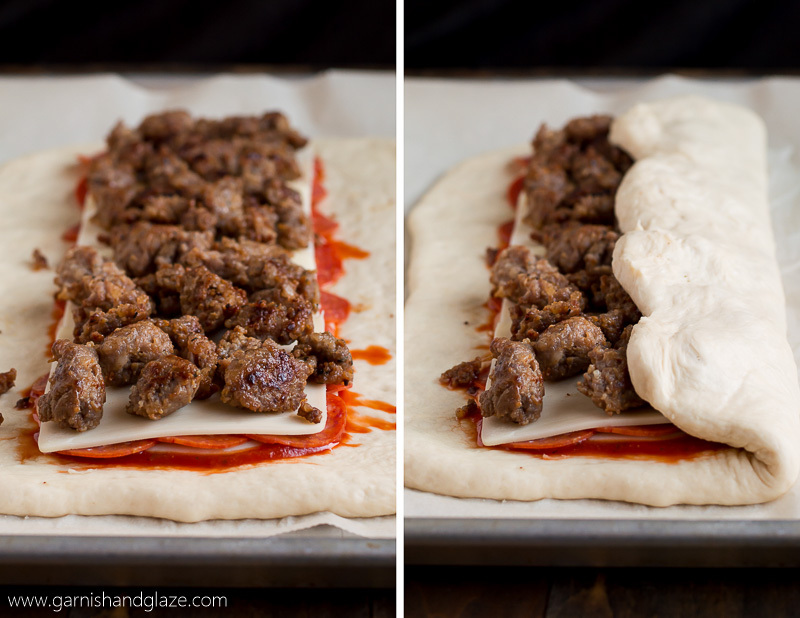 Spread sauce in a long strip down the middle of the dough. Layer on the provolone, pepperoni, mozzarella, and sausage. Fold one side in over the sausage and then fold in the other and pinch the dough together. 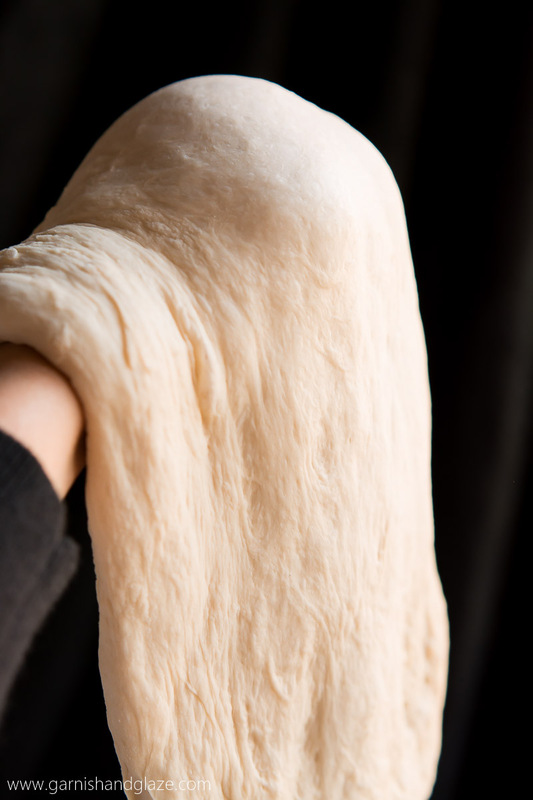 Then pinch the dough together at the short ends to seal in. Flip the long roll over, brush with egg wash, and sprinkle with the Italian seasoning and Parmesan. Bake for 20-23 minutes until golden. 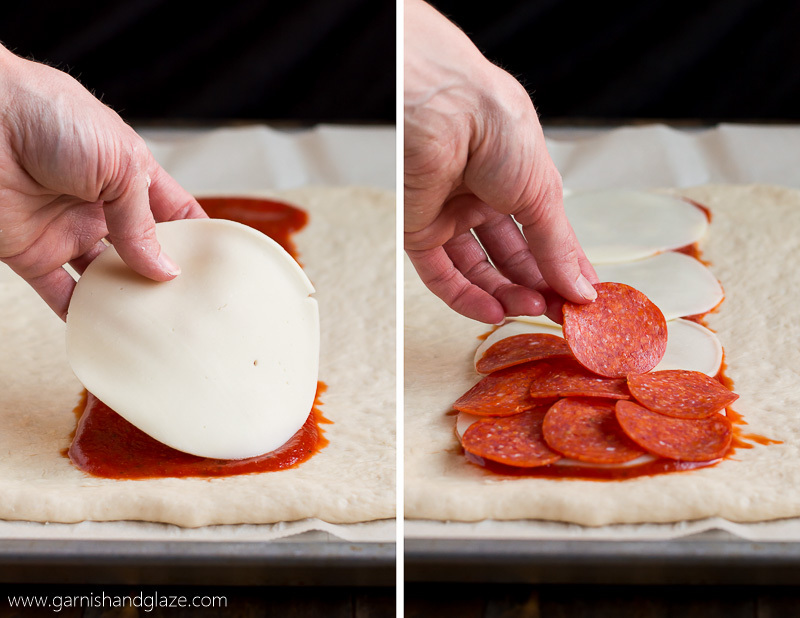 Let it rest for 5-10 minutes and then cut into 1 inch slices (12 slices) and serve with extra pizza sauce for dipping. 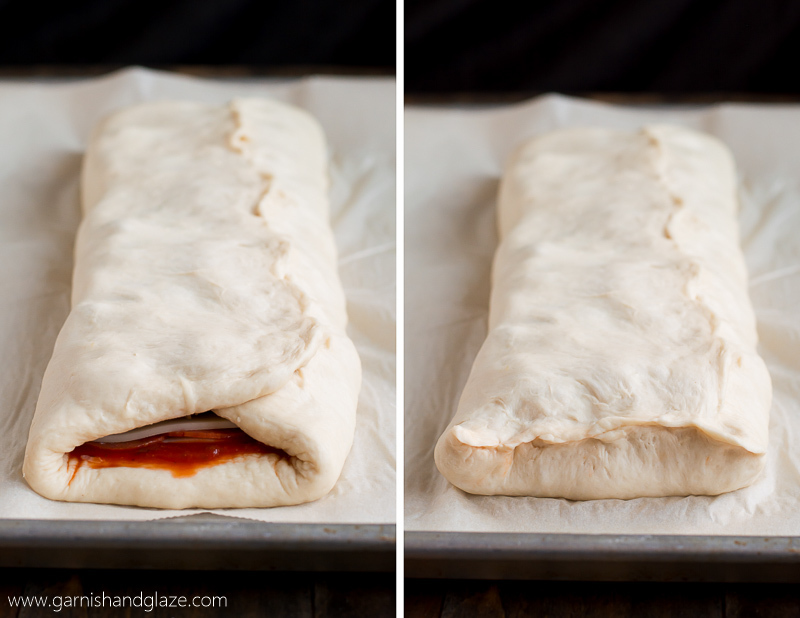 I have stromboli coming to my blog next week. Just made it yesterday How awesome. Nice! Can’t wait to see your recipe! Thanks so much Melanie! 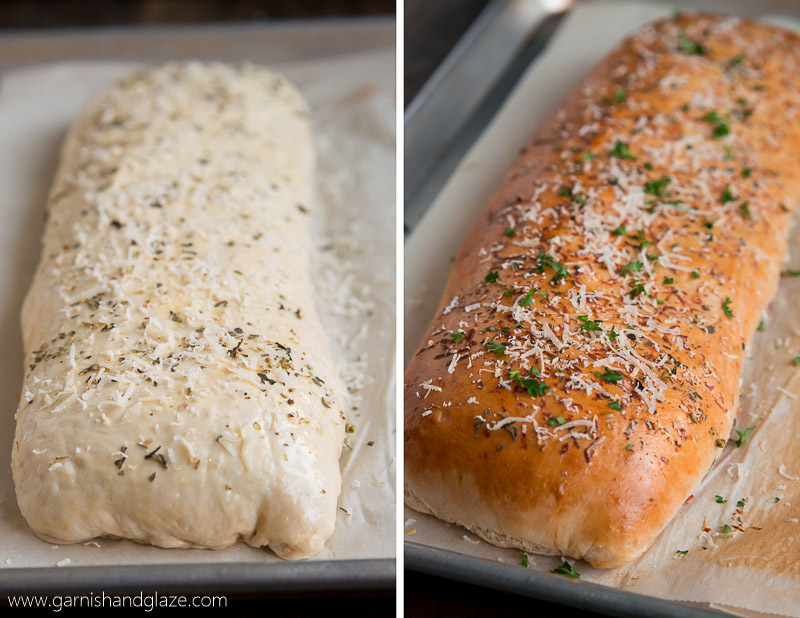 I used to make stromboli all the time a few years ago and haven’t made it in ages! We’ll have to try your recipe soon! This was my first time! I wish I had discovered its deliciousness sooner because it is amazing! 20 mins at what degree, exactly? Oh my gosh this was amazing! And so easy😊. My family loved it so much they ask for it again 2 days later! Thanks for sharing. Your pizza crust recipe is to die for.